Call of Duty: WWII Zombie Mode Full Cast Revealed | Nerd Much? The big reveal of Activision’s Call of Duty: WWII nazi zombie mode is coming July 20 at the San Diego Comic Convention. In anticipation, the publisher has released the full cast of characters that you’ll be able to choose from. These fine actors include David Tennant (Doctor Who) as Drostan Hynd, Elodie Yung (Netflix’s Daredevil) as Olivia Durant, Katheryn Winnick (Vikings) as Marie Fischer, and Udo Kier (Far Cry) as Dokter Peter Straub. Of course, the biggest surprise here is Tennant, as he is a part of the small British Pool of Actors™ and not often lent out to such American venues. Nonetheless, we will see how it is when we take actors who are not used to voice acting into a video game. Though I’m sure they will all do well, as most have been at this acting thing for a while now, after all. It seems that Activision is continuing it’s trend of using actors to sell their games as much as Hollywood does to sell its movies. Well, if Kevin Spacey and Kit Harington worked, why won’t Tennant? I certainly won’t mind seeing exactly what kind of character Drostan Hynd is exactly and how Tennant will play him. Call of Duty: WWII is to be released November 5 on the PS4, Xbox One, and PC. It is placed in Europe during the famous Normandy landing, among other locations that will take the player across the continent. The zombie mode is said to follow one of the many myths of WWII, in which Hitler apparently creates a last ditch effort to win the war. The effort, as it turns out, are an army of zombies gone wrong. It is up to the player to defeat them and make sure they don’t spread to any more innocent victims. 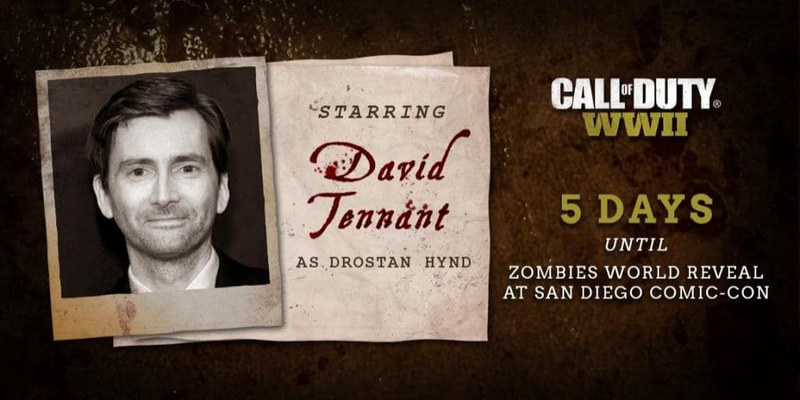 It is likely, judging by the names of the characters the above cast will be playing, that one of them participated in the making of these zombies. Hopefully they don’t turn out to be a turncoat, depending on how the mode will play out.